Open the AppleScript Editor on your Mac and paste the code in there. Click "Run" at the top of the window. If all goes well, you shouldn't see any errors and you should now have the "Send PDF to Evernote" option in the PDF menu of the Print dialog. Hope this is helpful. Post here if it doesn't work and I'll do my best to get you sorted out. The PDF to Evernote is great functionality. I'd still like to be able to clip something from the clipboard directly into Evernote via the Services menu. I'm now using Clip.to to accomplish that task, but don't you think it should be part of the product, as it is with Notebook, BBEdit and iData? I know I'd use it every day!! I am getting an error message. It's probably simple, but I do not use Applescript, so I can't fix it. I am using Version 3.0.6 (221382) on my MacBook Air 10.7.3. I also just tried this out, and it works. Only now I see both "Send PDF to Evernote" and "Save PDF to Evernote" in the menu. Is there any difference between those two options? This is great, thanks! Was really missing this functionality. Just a remark: the "PDF Services" folder didn't exist in my Library. Which made the script fail just as it did in rolfessenden's case. Manually creating the folder and subsequently running the script did the trick. I found that putting a new alias is in Library /PDF services worked fine, it still does not work (I get an unsupported message when I try to use "Save to Evernote" option) in Acrobat Pro X.
I'm getting this error when I paste into Applescript. I also receive an error when I run the script. Running latest version of Lion on Macbook Air 13. I use Mac Mail, and am trying to drag-drop PDF from Mail to Evernote. Cannot seem to do this. Have latest upgrades of both systems. I am not, however, using Premium of Evernote. I can do this easily with Mac Notes, but not Evernote. Is this a bug? I installed this on a new MacBook Pro (Retina) running the current versions of Lion and Evernote. I was referred to this posting by Evernote Support as a Premium Member. Thanks for any assistance you can provide. I rely daily on this function and miss it dearly. Imkedmn, this applescript solution didn't work. It is also too difficult. With Apple Notes, you just copy (or drag over) any PDF to Notes, and it works fine. It's nearly unbelievable that Evernote cannot do this. All my airline info is in PDF format, as are google maps, etc. How is it not possible to simply copy and paste a PDF? I also asked if the Premium version of Evernote can do this. If so, I'd upgrade to that. If not, I'll have to stop using Evernote, even though I like some of its other features. Does Evernote plan to fix this PDF transfer problem? It is so essential, I simply cannot believe that it is not available. PDFs are a little bit of a hassle. In Chrome you Print -> Open PDF in Preview -> Print -> Save PDF to Evernote. Obviously, that adds a couple of steps, but the actual time elapsed might only be few seconds. The process is identical for Free and Premium users. I wouldn't call it a "problem." It could certainly be streamlined, but it actually works quite well. GM, Thanks for the quick reply. I'm using the latest Mac OS, on MBP, not Chrome. If I open up anything in Mac Preview, there is no way to Save PDF to Evernote. Doesn't exist. Am I missing something? Hi Dan. I am using Lion on an MBA with the Chrome browser. I will fiddle around with Safari, but frankly, that browser (whatever its benefits) always manages to frustrate me. Now it wants me to install a printer. I have not printed a piece of paper in months now (I've gone paperless), and I am not about to set up a printer I probably won't even use (collecting dust in the closet now). If you switch over to Chrome, it is easy, but short of that, you'll have to save the PDF to your desktop (or into your Download folder) and then drag it into Evernote. It probably takes about the same amount of time (a few seconds). GM, I'm using Safari, not Chrome, as you surmised. However, that's not the problem, in my view. I have lots of PDFs on my desktop, of course, and from email enclosures. I cannot drag any PDF to Evernote. Thus, it's not a problem of the browser. Maybe I'm missing something simple. There is nothing in my Printer command (such as what Imkedmn suggested) that allows me to 'Send to Evernote.' Should I try to delete the App for Evernote, and reinstall. Maybe I have a corrupted App? But others seem to have the same problem. GM, thanks. I think you've solved my problem, which was simpler than I thought. It *is* possible to simply drag a PDF from the Mac Desktop into Evernote. But it is NOT possible to drag a PDF directly from Mac Mail into EN, like I do with Mac Notes. The extra step is to drag from Mail into the Desktop, and then re-drag from Desktop into EN. Isn't that correct? Don't know why this step is needed, but seems to work. Somehow didn't try it with directly from Desktop. Question: will it ever be possible to simply drag directly from Mail into EN? Or, again, am I missing something simple? The easiest solution for mail? Forward it to your Evernote email address. You can even send it to a specific notebook and assign tags. Use a third-party app like ifttt to do it automatically. It's a brilliant feature. Fantastic. Thanks. But taking this one step further, is there an Applescript (or Automator workflow) that will take a PDF and put it into Evernote automatically? This is part of a wider workflow where I'd like to use Hazel to watch a folder and when it sees a new PDF, I'd like the applescript to copy it (not move) and put the copy into Evernote. Needless to say this way beyond me! Hm, script runs fine, adds the menu item, and even starts (or brings to the foreground) Evernote, but the a new note containing the PDF does not get created. I have the same result as dbexternal. Fresh install of Mountain Lion, installed Evernote app from App Store, ran the applescript above, and the menu item "Send PDF to Evernote" is now there, but selecting it simply opens the Evernote app or brings it to the front. I have Send PDF to Evernote in my print dialog, however, Evernote opens but nothing happens. I have found the same as above also though if you right click and choose open in Evernote nothing opens. Same issue here. Fresh upgrade to Mountain Lion and no Save to Evernote option. Applescript only launches Evernote, no insert of PDF. That's it. It seems that the issue has something to do with apple application sandboxing. Yes it appears the Evernote on the App Store doesn't have the Save to PDF option. Downloaded and reinstalled from the link below and now it works. It seems that the issue has something to do with apple application sandboxing. Evernote People (assuming you monitor the forums) - Any update on the problems with Mac App Store Evernote v3.3 and "Print PDF to Evernote"? Any progress over the last few days? and then I downloaded the .dmg file to reinstall Evernote outside the App store as @txf01 indicates above. But now the Save PDF to Evernote works. I have the same issues...Print > Save PDF to Evernote...nothing happens. I spoke with Evernote support, and they confirmed this is a bug with the latest Evernote Mac client. They didn't give me any workarounds or any ETA for when it would be fixed. As a workaround, I Print > Open PDF in Preview and then drag-and-drop into Evernote. Works fine, but much more cumbersome than it used to be. As an aside, it makes me very sad that the Evernote development team is so prone to introducing these regressions with each release. Does not inspire confidence. I cannot speak for the Evernote developers, but I know of other apps (like VoodooPad) that have had to reduce the functionality of their apps the same way in order to get them into the Apple app store. I am guessing (I am not an employee at Evernote and have no knowledge about this) that Evernote is in the same boat. I am sure Apple has its reasons, and I doubt that Evernote developers enjoy removing features they spent time developing and maintaining, but that is how the system works. At least, that is how it looks to me. It isn't about "confidence", but about policies dictated by Apple. Do you have a fix for the new Mountain Lion? I tried the script it gave me an error. Put old EN into trash, clicked on your link, downloaded, drag to Applications, opened EN. I went to Safari to test it out. Below is what I did to see it. Just wanted to say thank you. I am a novice and therefore, had to find suggestions that were simple and straight-forward. I think advanced computer users would also look for simple and straight-forward answers, but as a novice, I had no other choice. Folks, listen to TFX01. It appears to me he knows what he is talking about. I put an alias to Evernote.app in ~/library/PDF (I had to create this folder). The Save to Evernote did not show up under the PDF menu in the print dialog. 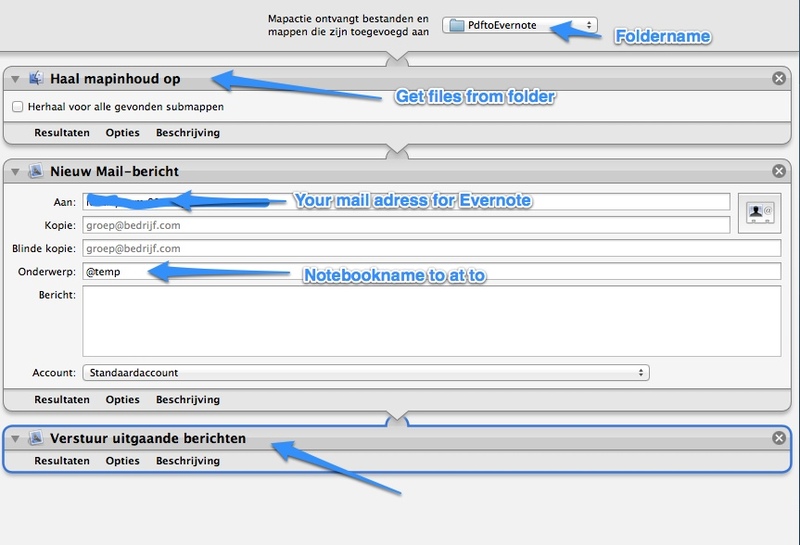 Is there any known method under Mountain Lion to Save (PDF) to Evernote? I usually want to print a PDF to Evernote from Gmail. I don't like the extra step to print a PDF to Downloads then drag to Evernote. I have Acrobat Pro and put in the script with no errors. I still don't see an Evernote printer or anything Evernote. Can you help?